THE SKINNY: Julep Daylight Defense SPF 30 was an extra freebie in a recent Julep Maven box. I love the idea of a summer moisturizer that you can use on your hands and face with a high-level SPF. The scent was light with a hint of oranges -- I loved the perfectly summer fragrance. I bet the formula is great for people with drier skin than mine. But for now, I will probably use it on my hands rather than face because I can't get enough of the orange-y smell. 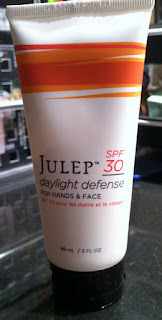 KEEP OR TOSS: I'll use the sample that came in my Julep Maven box, but it seems a little pricey for a product that I can't use for half of the year. CHECK IT OUT: I really love the Julep Maven program. It allows me to try a lot of new products (not just nail polish) for $20 a month and you can skip months without foregoing the membership. Check it out and make sure to search for a promo code, you can usually get your first month for a penny! You can also but products such as Daylight Defense on their own -- no membership required.